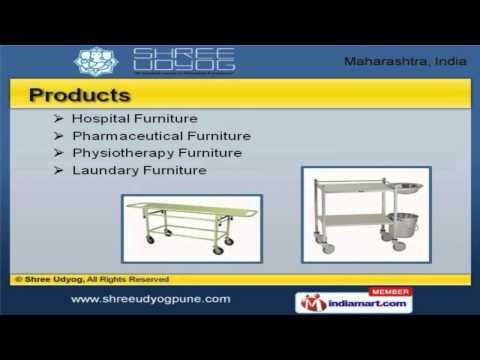 Welcome to Shree Udyog, Manufacturer and Suppliers of Hospital Furniture. The company was established in 1998 at Pune. International quality standards and Ethical business policies make us unique in the industry. Assured quality products, Time bound deliveries and Tamper proof packagings are some of the key factors behind our success. We offer a wide assortment of Hospital, Pharmaceutical and Physiotherapy Furniture. Our Hospital Furniture is best in the industry amongst others. Crash Carts, Instrument Trolleys and Syringe Pump Stands are in huge demand across the global markets. We also provide Pharmaceutical Furniture that are reckoned all over the world for their superb quality. We are highly instrumental in presenting a wide spectrum of Physiotherapy Furniture that is cost effective. Laundry Furniture are setting a benchmark in the market.